On Friday, the BlackBerry KEY2 launched in Canada. Next Friday, U.S. consumers will be able to get their hands on the device. Pre-orders in the states are being taken by Best Buy and Amazon. While the company that designed and built the phone is China's TCL, BlackBerry itself has always been headquartered in Canada, even back when the company was known as Research In Motion, or RIM. 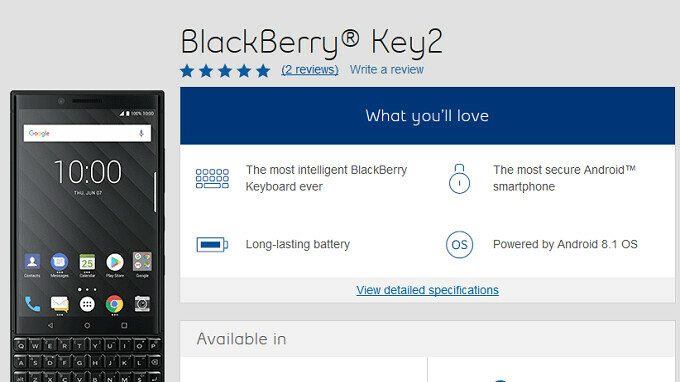 And that explains why Canadians usually get first crack at a new BlackBerry in North America. Bell-$99 CAD ($76 USD) with a 2-year pact. Device costs $875 CAD ($669 USD) to buy without a contract. Telus-$100 CAD ($76 USD) with a 2-year pact. Device costs $870 CAD ($665 USD) to buy without a contract. SaskTel-$99 CAD ($76 USD) with a 2-year pact. Device costs $800 CAD ($611 USD) to buy without a contract. Get $150 CAD off with trade. Rogers-$95 CAD ($73 USD) with a 2-year pact. Device costs $800 CAD ($611 USD) to buy without a contract. In the states, the BlackBerry KEY2 is priced at $649. That is $100 higher than the original cost of the first-generation BlackBerry KEYone. Sometimes you just can't beat a physical keyboard. At the cost of screen area? no thanks.. I prefer slider keyboard. Not for nothing, but he did say “physical keyboard” only. He didn’t specify form factor. i agree, i have a blackberry keyone black edition and i like it a lot! but i also have Samsung galaxy s8+. i was using mt black edition for almost a year now and for some reason i bounced back to my S8+ and im very happy with it! now i like my black edition a lot, but it has some issues that when i started using my S8+ it made me think twice! my most notable grime is the touch keys above keyboard which bb is not changing with on screen! Nice. Can’t wait for the KEY2 to officially release here in the states.